I've been thinking about reinvention. For the first half of my life - well, nearly half since I plan to live to be 96 - I have been shaped by things outside myself. Sometimes the shaping is gentle and other times it's brutal. For the next half of my life I think I get to decide who to be. 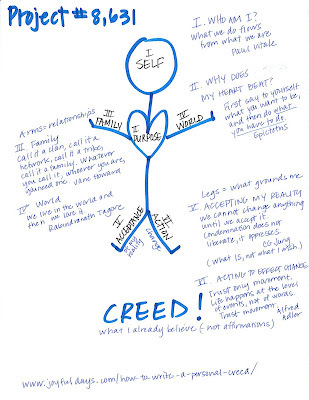 Here's where I'm starting: http://www.joyfuldays.com/how-to-write-a-personal-creed/. I've been taking notes. I'm excited to see where this project ends.